Leontina “LT” Hormel first learned about Syringa Mobile Home Park in 2009, when two students in her “Introduction to Sociology” class were residents of the park. In 2013, Hormel, an associate professor of sociology in the College of Letters, Arts and Social Sciences at the University of Idaho, read newspaper reports discussing a water crisis at Syringa, which is just outside Moscow. The residents discovered that the water they had been drinking was contaminated with coliform bacteria, E. coli, lead and chlorine. After the discovery, running water was shut off for 90 days. Having the connection to the two students who lived in Syringa gave Hormel an interest in the situation. She began conducting sociological research on the park and its residents after Magar E. Magar, the man who owns the park, and the residents reached a partial settlement. Hormel knew she wanted to act and help the residents in some way, she just needed a place to start. After discussing the matter with her former students, Hormel began her research in March 2015. 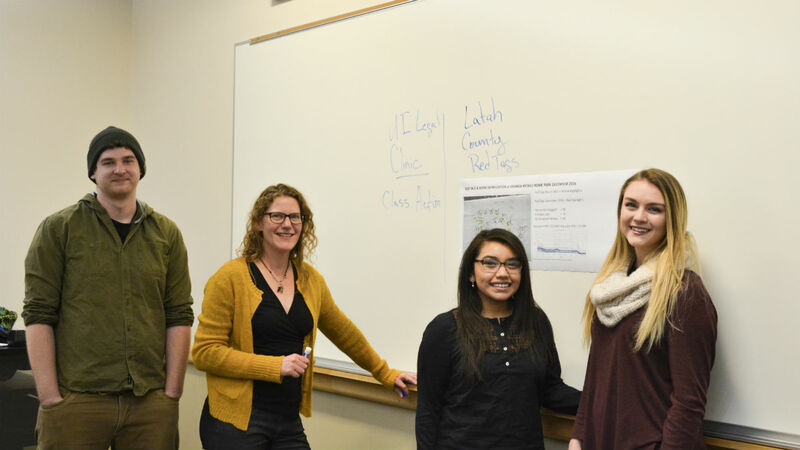 The research team consisted of Cynthia Ballesteros, Haylee Brister, Angelica Lopez, Kenneth Marcy, and Lincoln Smith, all undergraduates who studied different aspects of the Syringa situation. Also at UI, Maureen Laflin, a law professor and the director of clinical programs in the College of Law, led a legal clinic team that handled a class-action lawsuit on behalf of Syringa residents. Hormel's class began with a book that discussed a similar topic as the Syringa Mobile Home Park: “Evicted: Poverty and Profit in the American City” by Matthew Desmond. The book follows the stories of tenants and landlords in two Milwaukee neighborhoods: the predominantly black North Side and the predominantly white South Side. Desmond compares the experiences of poor households in each neighborhood. Hormel poses with some of her “Sociology of Prosperity” student researchers. 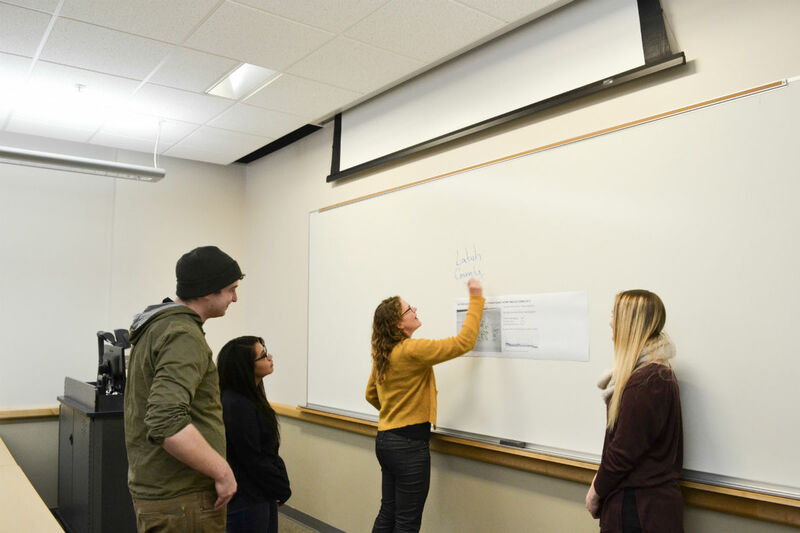 The students then conducted archival research, focusing on topics related to their majors. For example, Smith, an economics major, used his skills in business economics and business statistics to contribute to the team by entering data they collected into spreadsheets. Together, the team learned about the issue of “red tagging” in Syringa. When residents decide to move out of their mobile homes, for any reason from health to safety, Latah County places red tags on the trailers to indicate that the properties cannot be inhabited until the conditions necessary are met by the park’s owner. Some mobile homes are privately owned, but too expensive to move, leading owners to abandon them. The average value of a mobile home has decreased significantly in recent years, to an average value of $3,000. A study by Boise State University showed it would take $5,000 to $10,000 dollars to move the trailer out of the park, making it not worth moving the home at all. The main goal of the project was to continually give things back to the residents. Hormel wanted to make sure that the residents were being represented well, and also wanted the people of Moscow to think about the city’s approach to affordable housing. The class gave the students experiences they would not normally get solely in the classroom, said Ballesteros, a senior from Nampa, Idaho, majoring in sociology. Hormel led her student researchers in a study of a local mobile home park that had faced contaminated water. WRITER: Jordan Gonzalez, a freshman from Wenatchee, Washington, is majoring in anthropology.